process is a "mixed media" one. 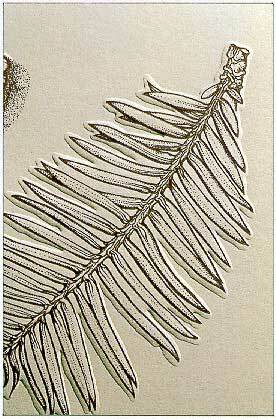 Photo-Lithographic methods produce the deep, wine-red line work, allowing each separate detail of the Wollemi Pine to be later embossed, lifting it proud of the background. 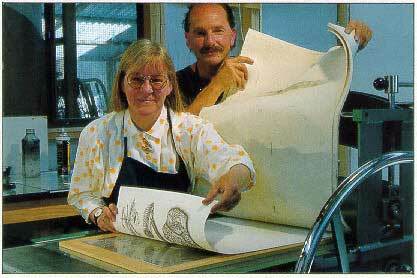 This is an unusual and distinctive process carried out under great pressure on the etching press. 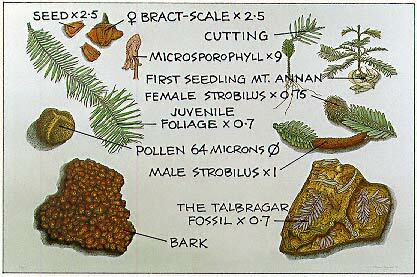 (3 distinct but inter-related images) is the one we chose for the design of the Wollemi. The tones were very carefully balanced, with the strongest and heaviest below, rising to softer and lighter details of fruits and foliage above. The central panel shows the mature tree rising up out of its deep gorge. We are both artists who also teach adults drawing, design and illustration. Chris's hand-coloured Wollemi will not be available through any galleries or shops. We are distributing this information sheet to selected research, educational and professional bodies, offering the work directly to people with a keen interest in and understanding of our subject. We hope, in this way, to provide you with more personal contact than is usually the case when purchasing art-work. Please visit our page with purchase and ordering details. 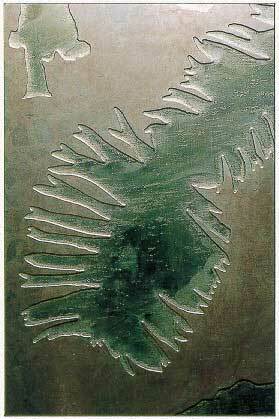 The embossing process, more correctly known as "de-bossing", leaves the subject standing up. A great debt of thanks is due to the many kind botanists, scientists and colleagues who made it possible for Chris to create an accurate record of the Wollemi Pine. Portraits have been presented to the Royal Botanical Gardens, Sydney, the Mt. Annan Botanical Gardens and to the National Botanical Gardens, Canberra in appreciation. to the original water-coloured embossed studio portrait is the four-colour half-tone reproduction printed beautifully for us by Goanna Print, Canberra's best fine-art printers. Identical in size, it is a very faithful facsimile on acid-free, 80% recycled Free Life Vellum - 140gsm. It is not embossed. All images Copyright 1998 Christine Payne.